The ADM20 is KS Digital's flagship Firtec DSP mixing and mastering speaker, and the most flexible nearfield monitor you've ever experienced. With Firtec, KS Digital has designed a DSP system that not only corrects for your room using advanced FIR technology, but also for the speaker enclosure itself--something no other manufacturer has accomplished. This industry-first innovation means that every ADM20 outputs an absolutely flat, phase-aligned, ultra-transparent signal that perfectly matches the signal fed to its input. It is the closest thing to a "straight wire" ever designed in studio monitoring technology, and it is 100% repeatable and exact between speaker cabinets, no matter when the date of manufacture. It is also the first digital speaker to feature a hardware remote that adjusts the volume AFTER digital conversion--through controlling the actual analog volume of the final output stage of the power amplifiers--thus providing a full resolution digital mix without degrading your bit depth or digital dynamic range. With ADM20's, you no longer need expensive outboard monitor controllers or digital faders--simply plug your digital (or analog) output into the ADM20's and control everything from the remote. So, the world's most accurate studio speakers also become the world's most flexible ones! When you're ready for even more power, add the ADM20-matched ADM W powered subwoofer, which turns this 2-way speaker into a 3-way suitable for the most detailed mixing or studio mastering work. The KS Digital ADM20 is a self-powered, bi-amplified, full-bandwidth 2-way speaker, 3-way with the ADM W.
Contained inside is a handmade LF carbon fiber 8" woofer, with a 1" dome tweeter. Powered by a 200W LF amplifier and a 100W HF amp, the ADM20 can handle the most dynamic material with ease, revealing details in your music you never knew existed. With a ruler-flat frequency response from 38Hz to 22kHz, these speakers are the ultimate showcase of KS Digital's adherence to "the sonic truth." You hear nothing but the actual musical performance as it was intended--no alterations of the signal, no distortions or anomalies... just pure, perfect reproduction. The comment most heard from engineers when they first listen to the ADM20: "I never knew it was possible to hear music so clearly." Using advanced FIR technology (hence the name, "FIRtec"), KS Digital accomplishes this DSP miracle differently than any other manufacturer--all of whom use traditional equalization and filters to achieve a flat response, which of course leads to phase issues and compromised dynamic response. Utilizing Firtec is like taking the veil off of traditional studio monitoring and DSP sound design, as it presents the music phase-perfect with full dynamic response--no compromises are made to output the signal as perfectly as it arrives at the input. 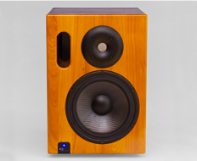 The ADM20 and the ADM W are designed to create a perfect 3-way speaker system, no stand needed. All amplifiers and digital controls are mounted on the back of the ADM20, and everything is controllable via the remote (hardware or software). When matched with the ADM W powered subwoofer, which is designed specifically for the ADM20, the system becomes a 3-way with a frequency response down to 25 Hz. The marriage between ADM20 and ADM W is a complete one--the ADM W becomes the speaker stand base for the ADM20, so together they form a completely integrated 3-way studio monitoring solution with no need for further monitor stands. What you get is a completely accurate presentation of your music in a "wall of sound" that rivals any nearfield / sub system made today, and what you hear is your music as it was intended, free of artifacts and distortions. Since the ADM20 controls the ADM W, all sub bass control is handled via the DSP in the ADM20--once again providing absolute phase alignment and perfect frequency / dynamic response. The Firtec DSP can also be tuned to your room so your studio speakers become even more accurate for your own particular environment--and as your environment changes, the DSP can be updated to match. As with all KS Digital studio speakers, the ADM20 is magnetically shielded for safe use near computer screens... and it is hand-built in Germany for you and comes with a signed Certificate of Authenticity, as well as a full 2-year warranty. … The sound is enormous, open, and transparent. Even in the highest frequencies and in the low sub frequencies, the ADM20 stays clean and controlled. At high volumes, the sound stays clear and precise. … Especially when listening to a recording of double bass and guitar, the ADM20 demonstrates its superiority. The lowest frequencies remain very dynamic and direct—muddiness is completely unknown to the ADM20. The double bass/guitar duet is completely 3-dimensional—at times you think you could look around the room at them. The sound stays real and differentiated at all times. Tiny nuances of the attack of the right hand and the breathing of the bass player sound realistic and natural. When listening to big orchestral recordings, the ADM20 shows its true forte—to differentiate even the most complex signals. In a virtual half-circle, the groups of instruments appear completely separated from each other, giving you full comprehension of the positioning of the stereo panorama as well as the room layout. … In the toughest tests, with extreme impulse signals like the breaking of glass or heavily beaten Chinese drums, we cannot trace any weakness. … In comparison with the ADAM S3A, it becomes clear that KS Digital is ahead in regards to impulse response and honest reproduction. The entire sound is a notch rounder and even more balanced than the S3A (which are a great product in their own right). At higher volumes, the sub frequency response of the KS Digital is more differentiated—here we get the impression that the S3A loses a bit, while the ADM20 keeps everything under control. 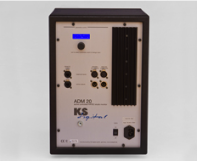 … KS had the brilliant idea that they could use high-powered DSP to program a unique inverse transfer function equalization curve for each of the ADM Series monitors, thereby neutralizing any inherent coloration effects. … What I heard blew me away like a hurricane. 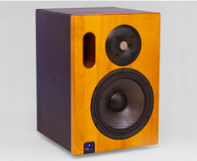 The ADM 2 (now ADM20) represents a paradigm shift for studio reference monitors. … In fact, I'd never before heard two-way monitors achieve such accurate spectral balance and extended response. Particularly impressive was the reproduction of low bass frequencies. You won't need a subwoofer with these babies. When the subterranean bass on Paula Cole's "Tiger" (from her This Fire album) kicked in during my listening tests, I literally whipped around to turn off my subwoofer--it was already off! The ADM 2s reproduced low bass so effectively that the bottom of my seat vibrated, with only 85dB SPL at the mix position. The rest of the spectrum, all the way up to airy highs, was so proportionally balanced and coherently reproduced that I just sat there, slackjawed, listening in awe. I couldn't hear any smearing of transients, as is common with other speakers. … They are articulate yet sweet, clear yet warm, detailed yet non-fatiguing. Bottom line: The ADM 2s sound absolutely amazing. … By comparing incoming audio to the speaker system’s response curve, FIRTEC regulates the unwanted cone oscillations or movements no matter how loud or quiet the sound is in the mix, so that any sound can be heard with clarity and space. This process basically is "unmasking” sounds that would normal be hidden behind irregular cone movements, allowing each sound to be defined in volume, depth and image position. … In almost every case, the ADM2’s (now ADM20) delivery of the sound was nothing short of quite astonishing. The bass response is very controlled, which almost results in an almost "live” performance type effect. … Certain exceptional recordings such as Metallica’s "Load” and the "Traffic” soundtrack were given new life and new dimension. Subtleties in these recordings not noticeable on other monitor systems were exposed. The result of that was a totally unique listening experience. … More interesting, however, was the lack of listener fatigue involved... I recorded, mixed and listened at different volume levels for many hours at a time without this problem. … There is no question, the ADM2’s are exceptional speakers. Their sonic reproduction was in most cases, quite excellent. Dimensions H 42 x W 30 x D 33 cm, 16.5" x 12" x 13"